The idea for this post came from a fabulous1 Coope, Boyes and Simpson2 song, 'Unison in Harmony'. There are a couple of versions of this song on YouTube, but the quality of the recording does not do them justice3. You’ll just have to buy their albums, which you can do at No Masters. If you’re lucky you even get a little thank you note from Jim (Boyes) with your CD (I love this. You don’t get that when you buy a Steps album. Or perhaps you do, to make up for the fact that you now own a Steps album). I have been thinking about the function of music in a church context. As I understand it, the sacrifice of praise is the idea that we no longer sacrifice animals for God, but instead sacrifice our time, energy and thought in making music that glorifies Him in His infinite variety. Not only is this a lot less messy (and more meaningful) than setting fire to pigeons or similar, for me it is the fundamental expression of faith. Even that isn’t strong enough: I believe that music and religion are the same thing. I should point out that Coope, Boyes and Simpson don’t share my faith4, and that’s just fine. I think, however, that we do agree on this point: what we sing is what we are. Elbert Hubbard says this: ‘Picture in your mind the able, earnest, useful person you desire to be, and the thought that you hold is hourly transforming you into that particular individual you so admire’5 and I think this can usefully be applied here. The blessing often includes asking God to pour Himself out, but I suggest that this is already happening. I also suggest that Hubbard’s idea that thought can be transformative also describes something that is already happening. If you accept my premise that music and religion are one and the same, then what is happening during the process of making that music is that God is pouring Himself through your instrument (or your voice, or your limbs) and out into the world as sound, so that you overflow with music and assorted holiness. The music is literally transformative: the musicians become His instruments, simultaneously praising God and conducting Him outwards through themselves. It isn't simply telling God that He is brilliant; He doesn't need to hear that, and certainly not from the likes of us. It is so much more, and so much more important, than that. However. I must at this point admit to a personal failing. I am only able to apply this to music that I like. Music that I like = religion. Music that I don’t like = not religion, and therefore (by my logic above), not music either. Duke Ellington6 said there were two kinds of music (good and bad), and I like both. I like Run DMC (gangsters), Duran Duran (what on earth? ), Spandau Ballet (terrible lyrics), Huey Lewis and the News (favourite band of Patrick Bateman) and the B52s (the chap basically can't sing at all). I like 'Show Me The Way' (nonsensical) and 'Girls, Girls, Girls' (really sexist) and 'The Look Of Love' (obviously not the Dusty Springfield song, but the stupendously silly song of the same name by ABC. Click on the link to watch the preposterous video, complete with an Alpenhorn, a guy eating spaghetti while Martin Fry bellows in his ear and an altercation with a Punch and Judy crocodile. And I don't like it: I freaking love it). This merely scratches the surface of my total lack of taste when it comes to music, so I hope you'll see that a song has to be truly awful for me to dislike it. And yet, I'm struggling to choose just one example of a song that I hate from the hundreds available. This is bad, bad stuff. Oooh, it’s bad. Take 'Shine, Jesus, Shine' (I include the link so that you can judge for yourself, but for the sake of your own sanity I beg you not to read the comments underneath the video as they will make your brain bleed). As Mitchell and Webb's snooker commentators might say, oh and that’s a bad hymn (it actually pains me to describe it as a hymn. I think the correct term is 'worship song', but that's even more horrible). It has everything: ghastly lyrics, a disjointed verse tune that puts the emphasis in the wrong places, a stubbornly unsingable chorus and a load of unnecessary clapping. Although my problem obviously isn't just with Graham Kendrick (who wrote this sentimental drivel, and so much else), but rather with all of that kind of rubbish, nevertheless I'm at a loss to tell you just how much I dislike his work and everything it stands for. It is bland, wet, waffle-ridden, predictable, simplistic, derivative braindead nonsense. It's lame and ridiculous and embarrassing, and entirely inadequate as a response to any of the things I believe God has done. Sacred music for evensong, Christmas, Holy Week and other such purposes aside, even if one just focuses on hymns for Sunday morning, we have 'O Praise Ye The Lord' and 'For All The Saints' and 'Eternal Father, Strong To Save' and 'Abide With Me' and 'Praise, My Soul, The King of Heaven' and 'Love Divine' and a hundred others: proper hymns with proper words that everyone can belt out without embarrassment. I include atheists here because I think everyone likes a good8 hymn. I think even people who don’t believe that God exists would like to think that, if He did, He would be the kind of God those hymns describe (‘His chariots of wrath the deep thunderclouds form/And dark is His path on the wings of the storm’. Now that's religion). Proper old-fashioned gospel would also be fine, of course, and entirely appropriate as a sacrifice of praise. But not wanky, whiney rubbish, bleated out over the rainbow-encrusted strap of a badly-tuned guitar, probably sung with eyes squeezed shut (is this sincerity or shame? Nobody knows), while in the background a motley assortment of instruments twang and hoob and blart their way through, I don’t know, 'Meekness and Majesty', in never-before-seen combinations of flute, trumpet, viola, ukulele, tom-toms and a tambourine no-one knows how to use or when to put down. It’s terribly well-meaning9, but does it really take the place of a goat breathing its last? I think even a goat earmarked for destruction would feel a little bit cheated to be spared death and immolation in favour of three horrible verses of, say, 'Knowing You, Jesus' (does 'Knowing You, Jesus' even have three verses? I don't care enough to check). Here is a link to a particularly hateful version of the song for those of you fortunate enough to be unfamiliar with it; the sub-gospel improvisation over the chorus just after the completely gratuitous key-change is mind-blowingly horrible. I suggest you get out your metaphorical cigarette lighter for the final chorus (so as to have something to stuff into your ears if it all gets too much). Oh, I could not hate this song more; I can feel my skin prickling into a rash as the nauseatingly soppy chorus approaches, which, in case you've not managed to listen as far as the chorus (and who could blame you?) has the following words: 'Knowing you, Jesus/Knowing you/There is no greater thing/You're my all/You're the best/You're my joy/My righteousness/And I love you, Lord'. Doesn't it make you want to vomit out of sheer frustration? It’s just not good enough to say ‘You’re the best’ to Jesus. You’re the best? He made the sea and sky and you and me and everything else, and then, for reasons we cannot possibly grasp fully, He died for you, Kendrick. Take it seriously. This kind of thing leaves me trapped between the Scylla of judgement (‘I really hated that. Were you playing the descant on a glockenspiel?’) and the Charybdis of hypocrisy (‘That bit on the glockenspiel was awesome! Can I jam with you guys?’). I’m ashamed to say that I would rather be judgemental than politely hypocritical. 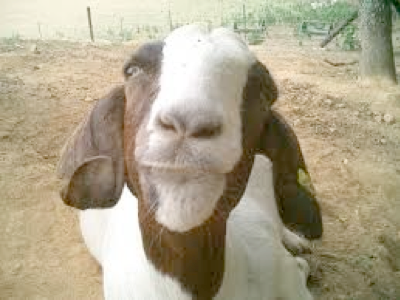 I am the uncharitable goat. 1 What am I saying? They’re all fabulous. 2 For my money the best vocal group in the UK. As well as being phenomenally talented, they are also tremendously humble, nice chaps. I met them at a vocal workshop at Queensbury Festival 2009 and came over all unnecessary. Garden Naturalist says I'm allowed to divorce him for one of them if I so wish, as (in his words), he'd do the same if he had the opportunity. 3 Instead, here’s their amazing cover of 'Now Is the Cool Of The Day'. 4 I base this assertion on another line from 'Unison in Harmony': ‘hearts on fire but/no Messiah’, which I believe they also wrote. 5 Seymour quotes a much longer passage and has some interesting things to say in his post. 6 I've heard this quotation attributed to Stevie Wonder as well, and I've also heard Ray Charles repeat it with the caveat 'I don't know who said this, but I agree'. I think Duke Ellington is the most likely originator. 7 This is also in total defiance of High Fidelity and what it has to say about Peter Frampton (although I think that's mainly focused on 'Baby I Love Your Way', which I also really like). 8 The words ‘good’ and ‘God’ come from the same root, and effectively mean the same thing: ‘good’ just means ‘of God’, so there is no excuse for hymns to be anything other than ‘good’. 9 Of course when done by people under the age of twelve this is utterly charming and therefore I like it and therefore it is music and holy. The nativity play at church this year featured just such a random ensemble of violin, trombone, piano and percussion, and it was adorable.